From the tree to the table. Maple Syrup does not come directly from the tree. As the sap starts to flow in the spring, it is gathered and processed into maple syrup and sugar using the methods of sap collection. 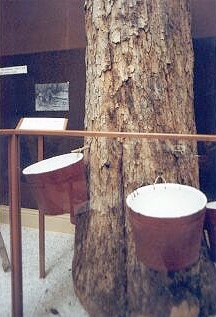 The Indians used the slashing technique and later it was discoved that boring a hole into the tree was a better way to extract the sap. Most maple sugar makers use power drills to bore the holes although some small operations still use the bit and brace. This large tree once produced hundreds of gallons of sap. It was over 400 years old when cut down near Belfort. The wooden shoulder yoke was used to carry two gathering pails. Snowshoes were and still are used in the sugar bush when the snow is deep. The sap pails would be emptied into the gathering tub on a sleigh pulled by horses. 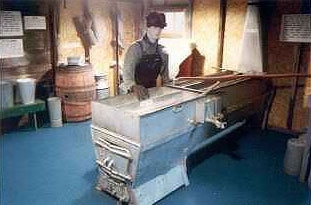 Sap is still gathered by men who empty sap buckets into pails then into gathering tubs but yokes are no longer used. The small evaporator shows the more modern way of boiling sap to syrup with a hood covering the boiling pans. There is a glass case that contains several special items. There are various kinds of metal and wooden sugarcake molds. 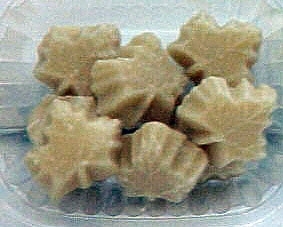 There is a metal multi-part sugarcake mold to make small individual pieces of sugar. The latest method of sap collections is the plastic tubing. The lines are run from tree to tree and from small lines to larger main lines then to tanks. This method works best on hillsides and eliminates the need to gather by hand. Sap is pumped from the tank either directly to the sugarhouse or into a large tank on a sleigh or wagon, then drawn to the sugar house.